Some time ago, something happened in my life that taught me how to heal from bitterness. I want to share my story with you today, as some of you have told me that you also need help from the Lord in this area. Something happened to me awhile back that was incredibly hurtful. It was a thing that absolutely devastated my life. There was no rhyme or reason to it; it simply happened. I forgave the people who hurt me. I really did; and I forgave them from my heart. Nevertheless, I really struggled with anger whenever I thought about the injustice of what had happened. After awhile, I noticed that the anger wasn’t going away. I was really struggling to get rid of it. And I also noticed that, whenever I thought about the injustice that had been done–and I got angry–I got a yucky feeling in my craw. It was a sour feeling that churned up my gut. That feeling was different from anger. That sour feeling was bitterness, and I actually felt it in my body. It literally, physically felt bitter in my body, soul, and spirit. Very bitter indeed. As soon as I recognized that the sourness I was feeling was actually bitterness, I went to the Lord about it. I knew that bitterness damages your mind, will, and emotions. I knew I had to get rid of it. I just didn’t know how. I knew I had already forgiven the people who hurt me. I had forgiven them from my heart, with all my being. I had prayed for God to let them off the hook completely and forgive them too. I prayed for them to be blessed. So it wasn’t a forgiveness issue. I had absolutely forgiven them. Recommended resource: If you’ve endured suffering or been treated terribly in life, run don’t walk to get my MP3 teaching set called 21 Kisses: The Sure Mercies of David for Your Life. In this powerful prophetic word, I teach about how God can and will take the worst rejections, wounds, and circumstances and turn them around for your good. 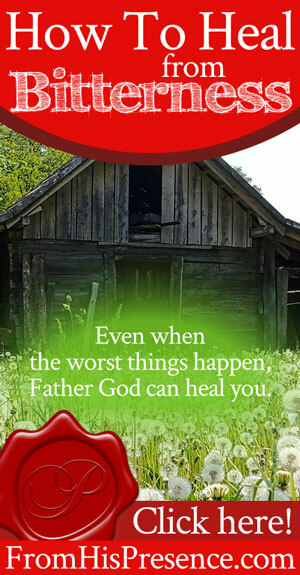 21 Kisses is about how Father will kiss your life with His mercy and favor, even if you’re at your lowest point. Download these words of hope today, and let God use His Word to restore your faith and joy! Yet, the anger hadn’t gone away. So it was obvious that there had to be more to healing from bitterness than just forgiveness. Let all bitterness, wrath, anger, clamor, and evil speaking be put away from you, with all malice. And be kind to one another, tenderhearted, forgiving one another, even as God in Christ forgave you” (Ephesians 4:31-32). “Pursue peace with all people, and holiness, without which no one will see the Lord: looking carefully lest anyone fall short of the grace of God; lest any root of bitterness springing up cause trouble, and by this many become defiled …” (Hebrews 12:14-15). “And David was greatly distressed, for the people spoke of stoning him, because all the people were bitter in soul, each for his sons and daughters. But David strengthened himself in the Lord his God” (1 Samuel 30:6 ESV). “As soon as Esau heard the words of his father, he cried out with an exceedingly great and bitter cry and said to his father, ‘Bless me, even me also, O my father! '” (Genesis 27:34 ESV). From these and other Scriptures, I saw a pattern: bitterness and anger go together. And anger, if it’s not holy anger, is sin. What is holy anger? Holy anger is God’s anger. It’s the anger you feel if you see a child or elderly person being bullied or abused. Holy anger is what Jesus had when He cleansed the temple of the people who were selling the required temple sacrifices for price-gouging amounts. Cease from anger, and forsake wrath; do not fret—it only causes harm” (Psalm 37:8). of which I tell you beforehand, just as I also told you in time past, that those who practice such things will not inherit the kingdom of God” (Galatians 5:19-21). I noticed several things from the Scriptures above, and from other Scriptures. First, I noticed that bitterness and anger are mentioned together. And when more than one evil thing nests together, one is often the root of the other. One demonic spirit works with the other in order to try to destroy God’s people. Secondly, I noticed that bitterness is a nasty thing that wants to get a root in your soul–to attach itself to you so deeply that you leave it there and let it fester. Which would destroy your soul. Bitterness sets in after we become angry. Anger is the root of bitterness. And anger happens (if we allow it to; we don’t have to allow it) when something bad happens to us in life. Does that sound familiar? This anger/bitterness thing is another twisted, insidious attack from the enemy. It’s a lot like how abandonment and rejection work together. When people develop a stronghold of abandonment and rejection, it happens because the enemy sends his demons of abandonment and rejection to try and destroy us after someone really has abandoned us. The enemy attacks right when we are at our lowest; when we’re hurting. And if we don’t keep our eyes on Jesus, then the enemy gets us to listen to those demons of abandonment and rejection, and he builds a stronghold in our lives. Well, the same thing happens with anger and bitterness. Look at the stories of David and Esau. In both of those stories, things really did happen that gave people reason to get angry. In Esau’s situation, Jacob had just stolen Esau’s inheritance. Jacob stole his blessing; his future prosperity and influence; and his place in the tribe. Uh, yeah, that’s a little something to get angry about. In David’s situation, while his men were busy being loyal and serving David, enemy invaders came in and stole all their wives and children. It wasn’t David’s fault, but that didn’t stop the people from getting angry. Those men didn’t know if their families were alive or dead. They didn’t know if their loved ones had been abused. Both their city and all their possessions had been consumed in flames. Yeah, that’s also a little something to get angry about too. However, in both those situations, the people took it farther than just being angry. They also became bitter. And in my situation, just like Esau and David’s men, something had happened to me that really did give me plenty of reason to get angry. But, it didn’t stop there. Just like Esau and David’s men, I allowed bitterness to grow in me also. It started with anger and progressed to bitterness. Did you see that? It’s really important. Anger came first, then bitterness. The first step to healing from bitterness is to confess our anger to God. Whenever we allow anything into our life that is not from God, the way to get rid of the evil is to go back and fix whatever we did to let it in. With bitterness, we heal by getting rid of our anger. And how do we get rid of anger? By forgiving first (which I had done already), and by confessing our anger as sin. And I stopped in mid-sentence. As soon as I even got out that first part, confessing that anger to God, I couldn’t even finish my thought because Holy Spirit broke me with repentance for my own anger. And right in the middle of that prayer, as soon as I admitted to God (verbally) how angry I was, He changed my heart. And as soon as I prayed that, I felt the anger drain completely away. But the bitterness was still there, and it needed to be healed. Then I prayed again for the people who had hurt me. And you know what? As soon as I asked the Lord to heal me from that bitterness, I could feel Holy Spirit soothing me with His healing Balm of Gilead. He absolutely touched my heart and removed–AND HEALED–every bit of bitterness. He healed me, and I felt totally different. And neither the anger nor the bitterness have returned to this day! The Bible says that a curse without a cause cannot alight (Proverbs 26:2). The enemy doesn’t have any access into our lives unless we open a door and grant him access. So if we have an open door to the enemy, we need to close it. And when we confess our sins to God, repent, and get filled again with Holy Spirit in all those places–and when we renounce our agreement with the seduction of the enemy and the lies we’ve been believing, confessing God’s truth instead–we close the door to the enemy. Are you struggling with anger over something that happened to you? Do you need to heal from bitterness too? Verbally acknowledge (confess) to God that your anger is sin, according to God’s Word. Renounce agreement with anger and bitterness. Command the spirits of anger and bitterness to leave you. Ask Father to fill you with His Holy Spirit in that place. Then ask Father to heal you from bitterness completely. Healing from bitterness doesn’t have to be a long process. It’s not complicated. Jesus already paid the price for all your sins to be forgiven, and for all the wounds of your soul to be healed. So if you’re struggling in the aftermath of pain or injustice today–struggling with anger, struggling with bitterness–are you ready for Father to heal you? If so, follow the steps listed above. Ask Holy Spirit to help you walk through them. And Father God will watch over His Word to perform it. He will forgive you, heal you, and set you free. “Heavenly Father, I confess that I have been angry at _____ for ______. I’m so angry, and I admit it. Oh Father God, I’m so sorry for being angry. Please forgive me. I know this anger is wrong. I confess it as sin. Forgive me; cover me; wash me in Your blood, Lord Jesus. Fill me with Your Holy Spirit where that was. Am really struggling with it. I hear voices. I have prayed and prayed. I get tormented from morning till evening. I had a session with counseling with you. Sometime ago. I hate that you are struggling, but praying and praying is not always the solution. Forgiving and forgiving is, and confessing your sin to God so you can receive His forgiveness is. Ask the Holy Spirit to convict you in any areas where you need to forgive or confess any sin to the Lord, and follow what He says. Then, you must hide His Word in your heart so your mind can be renewed and transformed. These things will help you. 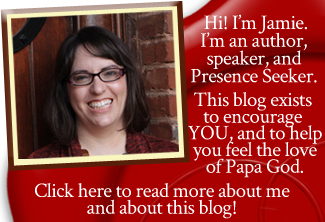 Excellent article!…really ministered to me. Recently joined your email list after reading some of your articles and spending time on your website. I could sense the presence of God as I was reading your material. It is definitely not shallow. I could sense that God has made a “deep well” in you, and He is going to use it to minister to many who are thirsty (me included!) Please be encouraged and keep moving forward in what God is doing through you! I really get this, I was sure I had forgiven people, but recently I had the yuck. Years ago, every morning, I would literally vomit stomach acid. I always had Mylantas. I must have been healed of that but last week I was reaching for antacids again. I did the fast, I was fine. I can even eat late at night if have to and it doesn’t bother me, so what was up? I did have the Lord to whisper about anger. He didn’t want me to be angry about my past or my calling, sometimes it is difficult to get through to people, not the ones I write for, the ones I talk to. It is like that horrible groundhog movie reliving it every day, that’s what hell would be alright, only forever. And you know what? It’s heaven too. Falling in love with Jesus again and again. Now, when I feel sour, I know what to do. It wasn’t the pizza. It’s bitterness trying to get back in and it goes with anger, I agree His holy anger is another thing. I have also learned that distraction and destruction go together is that helps anyone. The enemy will always try that one. Thanks, Jaime. Love talking to you. Thank you for this post. I have been going through a similar issue; someone really hurt me, I forgave them in my heart and continued praying for them. But every time I thought about them I had ‘vengeful’ thoughts; I kept confessing my vengeful thoughts but that did not seem to help much. Then I cried to Abba Father and asked for help and I heard it in my spirit that I was still angry. After fighting with this for a while I admitted my anger; confessed it and asked the Lord to fill me with Holy Spirit led thoughts of this person and now even my prayers for them are different. God my Father taught me that admitting the pain caused is also important and a start with dealing with anger issues. Admitting to myself and to God. Thank you very much Jamie for all the revelations God is using you to bring to my life. Be blessed always. i am so glad you talked about bitterness i now know i was meant to hear it and read about it i got to go to pastor Joel Osteen’s event here in Las Vegas last night and he talked about bitterness as well. this is something i struggle with along with anger, thank you so much and god bless you and your family. Very insightful, helping me to identify the missing piece of puzzle in deliverance. pray for me and for my breakthrough to be happen soon. Hi Angelin! Thank you for reading. I pray Father would give you grace and inspiration as you follow His steps in His Word to be free! She whom the Son sets free is free indeed! Oh wow. This is a message I really needed. As I was praying these prayers I actually couldn’t own them for myself. The Holy Spirit revealed to me instantly that I couldn’t because I needed to repent of feeling justified for my anger before repenting of my anger. I’m guessing that may very likely be a pride issue as well. This message was much needed for my soul. I will be working on forgiveness and giving my situations to God. So I can heal from anger and bitterness. Thank you Jamie. I have to admit that I read this and thought, “No way it is that simple! I have been praying the Lord would heal my heart from bitterness for YEARS!” Then the Lord shared with me, that while that was true, I had not ever repented of the anger that allowed the bitterness to be there! I could not be healed because I was allowing it permission to stay in my heart! AMAZING REVELATION! And the funny thing is, I have had that very conversation with so many people! How in tbe world did I not apply it to my own heart?? Definitely one of my biggest breakthroughs I have had in years! Thank you for sharing! Our testimonies truly are so powerful! Thank you for the specific way to pray away the bitterness. Thank you for your testimony! It really encouraged me and thank you showing me how to pray and up root bitterness . Thank you for sharing the simplicity of the power and desire of God to heal us in such a tangible way. God has really touched me this morning through your message right here in my office. i can sense He has totally released me from bitterness/anger abandonment and rejection. Thank you so much for the simplicity of the Word without being judgemental.